Let’s talk about the best white paint colors for your home. 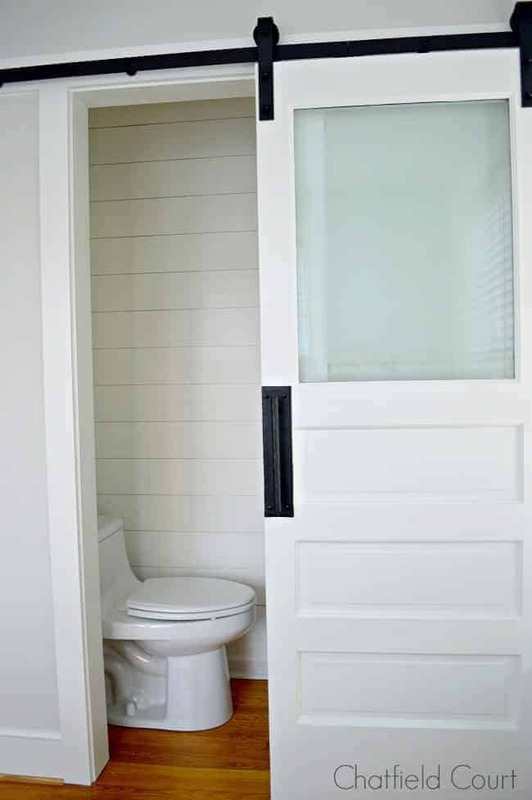 What is it about white paint colors? There’s no denying that white is in. 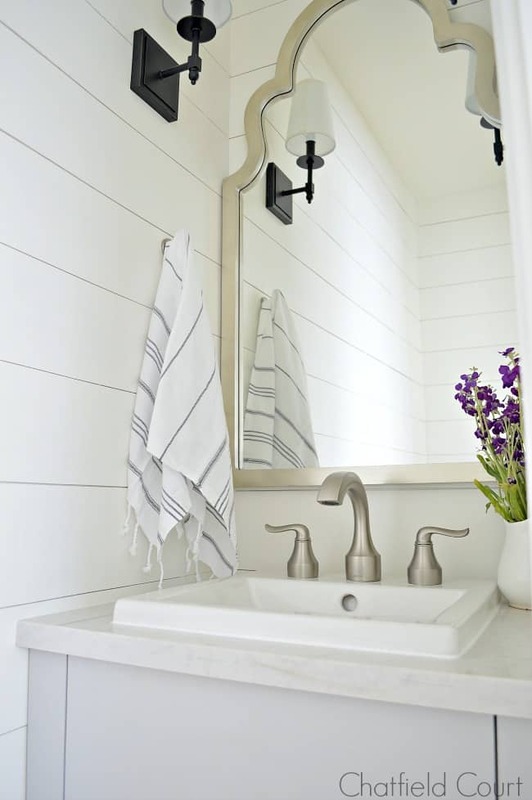 White paint colors have been around for a long time and yet they are as popular as ever. 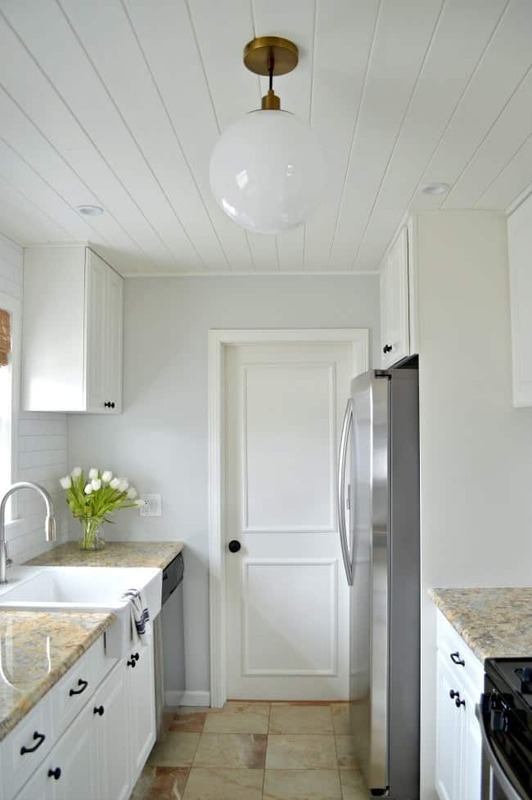 Whether your painting kitchen cabinets white or your walls, there’s a white for everyone. I started my quest for the perfect white paint color when we were planning our kitchen remodel in our Illinois house. 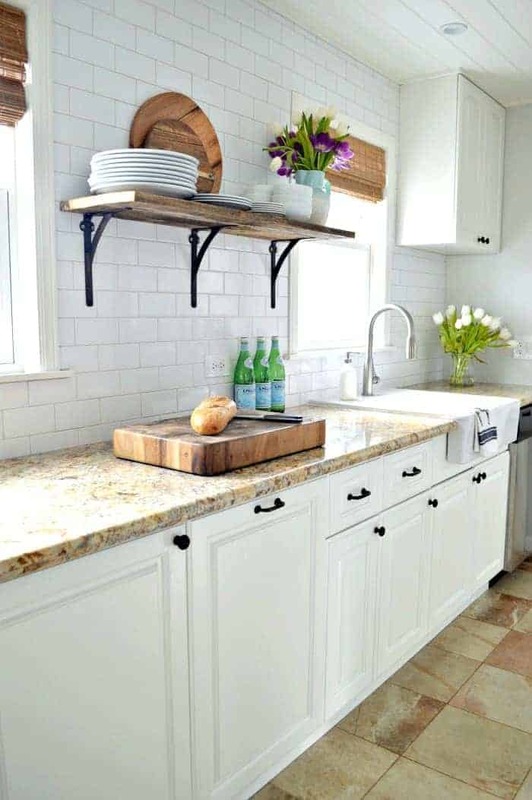 I checked out a lot of whites but ultimately narrowed it down and shared some of my favorites in my 5 popular whites for kitchen cabinets post. While they’re all pretty colors, I did end up finding a favorite out of the 5. One thing you need to know about me is that when I find something I love, I stick with it. I used my true love white on the kitchen cabinets, as well as the rest of the kitchen, and now use it in our little cottage. Before we get to my all-time favorite though, I want to share another pretty white I’ve used. I can’t take credit for choosing this color because it was already in our house when we moved in. 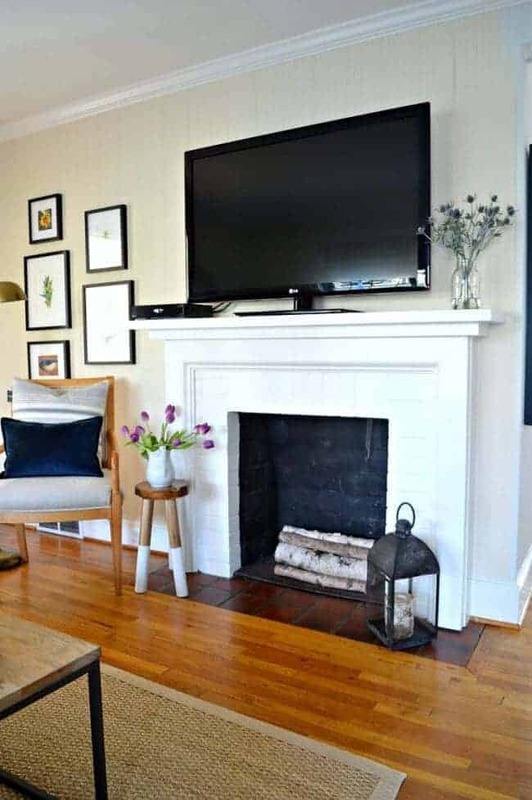 I had no idea what color it was until we started our fireplace makeover. The previous owner was nice enough to leave all of the old paint, so I was able to figure out what it was and color match it. SW Alabaster is a soft, warm white. It’s a pretty color but if you’re looking for bright white, this isn’t it. We also used it on the bathroom door. Actually most of the doors and trim are painted with SW Alabaster. I’ve changed a few rooms, like the powder room and guest bedroom we’re working on, but for the most part it’s all SW Alabaster. So, what is my all-time favorite white paint color? In my book you can’t really go wrong with it. Just like SW Alabaster it’s a soft white. Actually, they’re very similar, but I prefer BM White Dove. Our kitchen remodel in Illinois? The paint color turned out to be the main attraction. We painted the tongue and groove plank ceiling in a pearl sheen and the kitchen cabinets were done in a satin sheen, as was the trim. All of it in BM White Dove. Because I loved how it looked in our Illinois kitchen, we have continued to use it in our new little cottage. Initially, I was afraid that I wouldn’t be able to use it in our new house. After all, lighting in a room plays a big part in how paint colors look in your house. I pulled all of my sample boards out when we moved in and I was thrilled to see that it looked just as good as it did in our old house. The first test to see if it really worked was in the powder room we just finished. I used it on the plank walls, ceiling and trim. Even with no natural light it looks great. 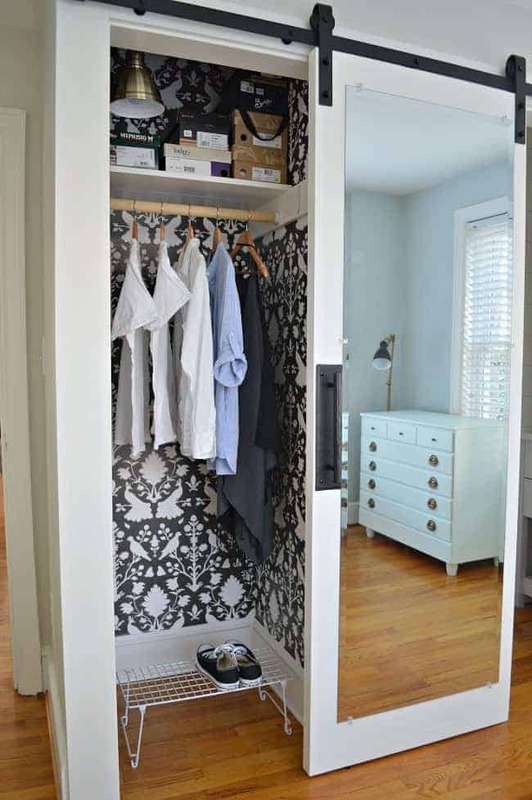 The trim in the guest bedroom, the powder room barn door and the closet mirrored barn door all got the same treatment. What can I say, I just love it. So, how can you find your best white paint color out of all of the hundreds of options? You need to test some out…in the room that you want to use it in. Picking out a little paint chip in the store, without looking at it in your room, isn’t going to cut it. I like to paint a sample on a large piece of poster board and then I put the board in the area that I want to paint. Keep it there a few days. Look at it in different light. I promise you’ll find your perfect match. 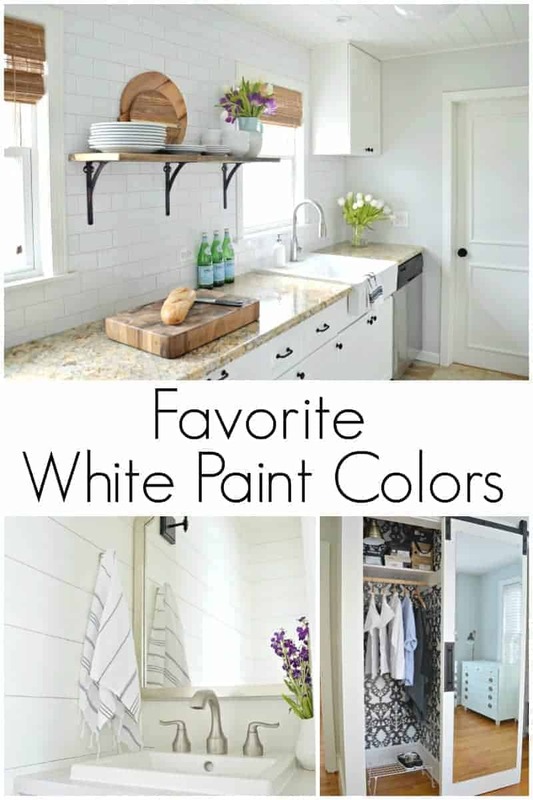 The best white paint colors…what are your picks? Thanks Joice! I’m a huge fan of White Dove and hope that it works out well for you. I agree when you find a color you love stick with it. I finally found my neutral color after going with different colors. I like your idea of using a poster board painted with the color you are thinking of trying out. It is so hard to visualize from a small paint chip. Who is your bathroom faucet manufactured by? Do you know the name of it. Love it! Hi Sally! The faucet is made by Moen and it is from the Hamden collection (which seems to be discontinued). Hope that helps. PS How about some ideas on grays? For a room that faces north? Thanks for sharing your experience with white paint Susan. I’m glad that you found something that worked for your room. It is definitely tough though, there are so many choices. I need to paint again, but i do like white for my walls and a creamier white for trim. I may even try a light gray in some of my rooms. I love your kitchen and sun room so i may try some of your white paint color. My go-to white is Valspar’s Dove White. 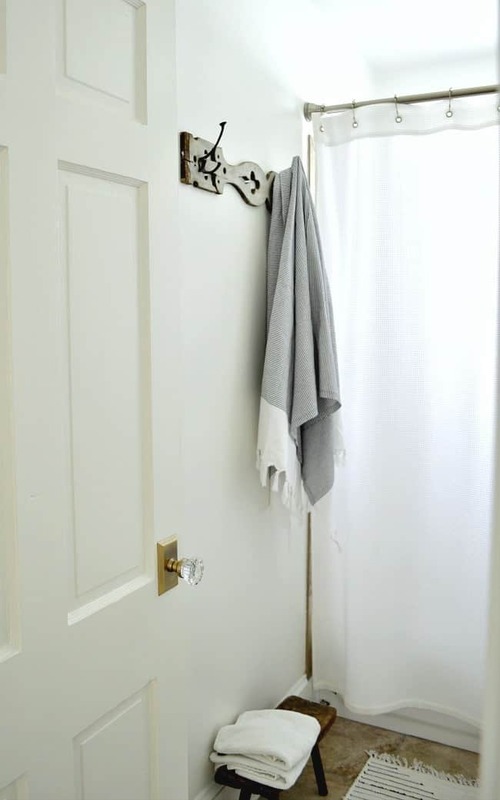 Not on walls, where I’ve used gray in large areas, and dark jewel tones in my two small bathrooms, but otherwise on every inch of ceiling, all repainted kitchen and bathroom cabinets, and all doors and trim. I recently had some new floor trim put down and it is pure white, so now have to repaint since Dove White is not a pure white, if pure white is what you’re looking for. I hate making paint decisions, so if I’ve found something I like, I stick with it. Whites are hard ….. Thanks for sharing Pat! I agree with you, whites are hard. That’s why I stick with what I love. I’m glad you found one that you love too. 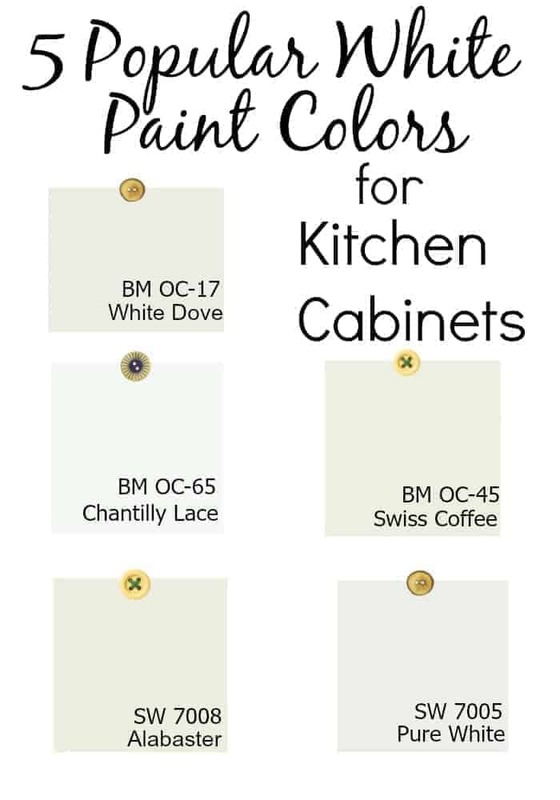 I’m about to start painting my kitchen cabinets and I wondered if there was a special paint to paint kitchen cabinets, but it looks like you didn’t use any special cabinet paint other than the color. Did you use a flat or gloss paint on the cabinets? I didn’t use special cabinet paint but I did use BM Advance in Satin finish. It almost acts like an oil paint in that it gives a smooth finish. Love, love, love that paint. It’s pricey but I highly recommend it. Check out my post I did on painting the kitchen cabinets. I talk more about it there. There is this paint called “Beyond” specially made for painting cabinets and furniture. It is self-leveling and I found it a demonstration that someone did on Pinterest. It’s not too more expensive than any other paint and you get a kit with a roller brush and some other things. I think I might use that. Have you ever heard of it? I have heard of it. I would just be sure that, whatever you use, you do a lot of research. Read reviews. I haven’t used it but have heard it chips. Painting kitchen cabinets is no joke so you want to use a good paint that won’t chip (because you won’t want to repaint them or constantly fix them). Just my two cents. Like you said, it depends on the house and lighting on favorite colors. I always go for a white with a yellow cast to it. When I lived in Islamorada I painted the whole house in Benjamin Moore’s White Linen. My condo was a similar color but I can’t remember the name or brand. My new home, if it appraises for the price, is all brown. Brown walls, counters and cabinets. Brown is my least favorite color. I don’t know if I am up to painting all 1100 sq. ft. and I know I cannot do as fine a job as you did in your Illinois home. I loved the kitchen in that home. You and the hubs did a wonderful job. Thanks Debbie! I still miss that kitchen. I just wish I had more time to enjoy all of that hard work before we moved. I know you’ll transform your new house. Looking forward to hearing that it’s yours! 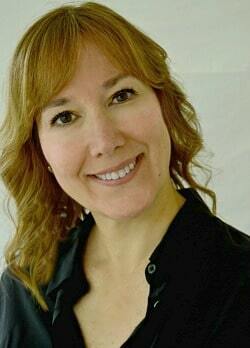 Kristi, I wanted to thank you for such a well written articulate post. You certainly put much time and thought into discussing how each color of ‘white’ played its role. Many of my questions have been answered and I’m nowvprepared to start projects that have only been in my thoughts and dreams. Thanks Mary-Louise. What a great compliment! I’m glad that you enjoyed my post and it made you feel empowered to start your own projects.